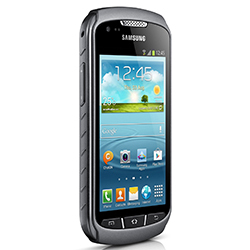 Samsung Galaxy Xcover 2 Is Here! Is official, the new Samsung Galaxy Xcover 2 is here! The Xcover 2 is an android 4.1 Jell Bean device and it is IP67 certified. That means that you can use the phone in the water or dive headfirst up to three feet. If you are passionate about diving and photography, then this phone may be for you because you can take pictures underwater. It is also worth mentioning that the phone comes with predownloaded Google Maps data, A-GPS with GLONASS support, 1,700 mAh battery and some active lifestyle apps like Cardio Trainer Pro.